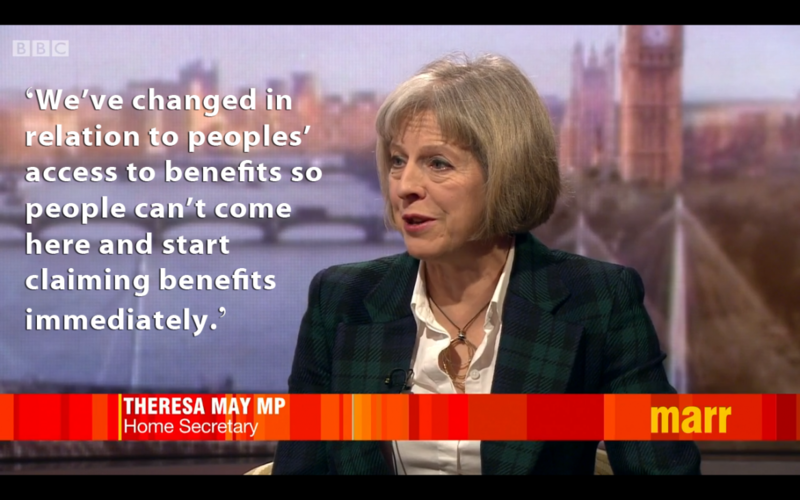 Was the Home Secretary, Theresa May, right to make this statement on today’s Andrew Marr Show on BBC TV? What Theresa May didn’t say is that it’s never been the case that EU migrants can come to the UK and ‘start claiming benefits immediately’. 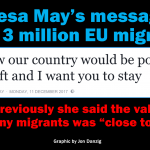 The Home Secretary didn’t actually say why she thinks EU migration to the UK is such a bad thing, but the fact is that without migrants, the UK would be considerably poorer. Ms May also didn’t make clear that the numbers of EU migrants here are already well controlled – by the jobs market. EU migrants mostly come to the UK to work, and if there is no work, they mostly either don’t come, or they go back home again. That’s why claims that 29 million Romanians and Bulgarians could now come to the UK were blatant scare stories. Such numbers won’t be coming to the UK for one basic, simple reason: we don’t have 29 million job vacancies. 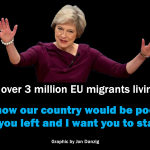 Theresa May also didn’t say that the EU numbers are already well balanced: there are about the same numbers of citizens from the rest of the EU living in Britain, as the numbers of Britons living in the rest of the EU. So if all Britons came home, and all other EU citizens here went home, the population of the UK would be about the same as it is now. • Contrary to popular belief and media misconception, EU law does not permit EU citizens to move to another Member State and immediately claim benefits. On the contrary, there are specific arrangements within EU law to prevent people from misusing the benefits systems of other EU states. These rules are covered by Regulation EC/883/2004 of the EU. • EU migrants to the UK have to pass an ‘Habitual Residence Test’. Just arriving in the UK doesn’t give a migrant any rights. The migrant has to prove that they are actually residing in the UK with the intention of permanently settling here. • EU nationals enjoy a right to reside in the UK for up to three months as long as they do not become an unreasonable burden on the social assistance system. They can then only legally stay longer if they are jobseekers; workers; self-employed; students; self-sufficient; permanent residents (i.e. legally here for more than five years); or family members of one of the above. • A European Commission Study concluded that there was “little evidence” to show that “the main motivation of EU citizens to migrate and reside in a different member state is benefit-related”. Most migrants who move to the UK do so to work or study – the same reason that most people from the UK move to other parts of the EU. 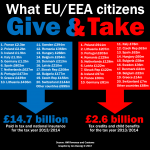 • EU immigrants from Central Europe to the UK are around 60% less likely than British natives to receive state benefits, or tax credits, or to live in social housing. Last year there were more British claiming unemployment benefit in Germany than Polish claiming it in Britain. • Three times the EU Commission asked the British government for evidence of so-called ‘benefit tourism’, but the UK government was unable to provide any. • According to research by University College London, new migrants to the UK from other parts of Europe in the last decade made a net fiscal contribution to the UK of about £22 billion. Most citizens here from the rest of Europe are in gainful employment and make a substantial net contribution to our economy. If those EU migrants hadn’t come here, the UK would be substantially poorer and our national debt considerably worse. This entry was posted in Current Affairs, Democracy & Citizenship, Economics & Trade, Politics & Public Policy, The EU and tagged benefit tourism, European Union, Home Secretary, immigration, migration, Theresa May, unemployment benefits. Bookmark the permalink.